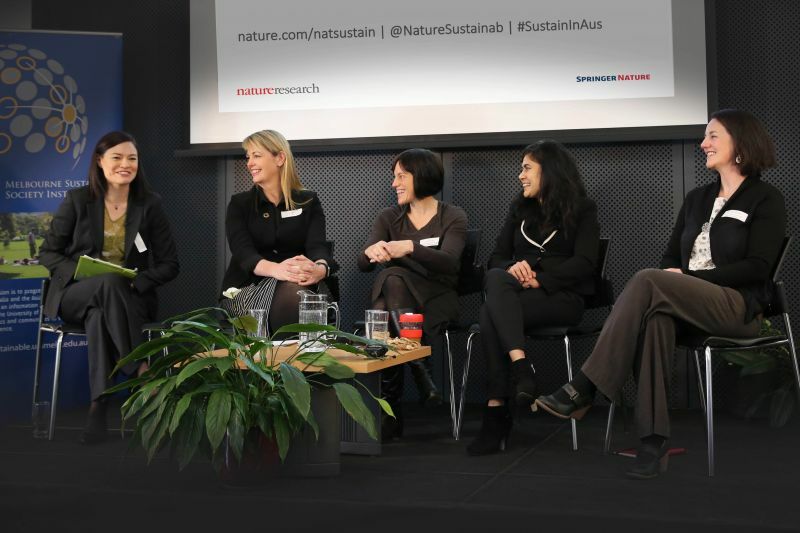 This week MSSI hosted the Australian launch of Nature Sustainability, where an audience from institutions across Australia listened to Chief Editor Monica Contestibile and a panel of sustainability experts talk about the crucial interface of sustainability policy and research. In explaining that Nature Sustainability does not embrace just one definition of sustainability, Monica emphasised the journal’s aim to publish interdisciplinary research that bridges the gap between science and the social sciences. More than ever before, there is strong demand for science that can inform decision making and shape policy. As Monica stressed, science is crucial but can no longer stand alone, and we need to be able to translate it in to a way that can inform behaviour and societal change. Interdisciplinary research that does this has historically struggled to find a place in many journals and academic spheres, but Nature Sustainability hopes to provide a home for this work, in turn providing promise to researchers who understand the value in it. Although some may argue that academic institutions are slow to catch up, it was agreed that there is a strong movement towards breaking down these silos of research. Funding bodies and the private sector now request interdisciplinary teams to provide evidence and solutions to real world issues, and interdisciplinary research institutions such as MSSI are only increasing in their influence and impact. Whilst the amount of research and research platforms focused on sustainability is on the rise, there was acknowledgement from Monica that the world of robust peer reviewed research remains inaccessible for many - especially those in the global south living and creating policy in places that are already experiencing the effects of climate change and the impact of the world’s unsustainable lifestyles. Nature Sustainability is, like other journals, trying to remedy this by sourcing referees and authors from the global south, or providing short briefs to accompany longer articles that are able to be accessed and understood by those outside paywalls. But it was agreed that there is a long way to go in this area, and the conversation is one that must continue to evolve in order to ensure more diverse and inclusive research. For those who came eager to find out how to see their research published in Nature Sustainability, Monica provided some key pieces of advice. Firstly, to really consider the audience you want your research to reach, and whether or not this aligns with the journal you are submitting to. Whilst there is no concrete definition of sustainability that the journal adheres to, in order for research to be considered it must recognise the interconnection between the human and natural world. For an idea of what that looks like, an article published earlier this year on how to live ‘A good life for all within planetary boundaries’ is both a great example, and a favourite of Monica’s. After hearing from Monica, the audience listened to an all-female panel discuss what interdisciplinary research and evidence backed sustainable policies looks like in Australia. Professor Rebekah Brown of MSDI spoke of the success in the water space of interdisciplinary research, where terminology like ‘water sensitive urban design’ is used in shaping policy and informing practitioners, and the Cooperative Research Centre for Water Sensitive Cities is changing the way we think of city design, building and management. The audience heard form Kath Rowley of DELWP about how government departments are embracing change and interdisciplinary work, for example the integration of health outcomes with a modernised EPA. Health outcomes are also significant when it comes the things we can’t see, such as what is in our atmosphere. Dr Robyn Schofield spoke of the positive outcomes for both human health and the planet’s climate after the 1987 Montreal Protocol on Substances that Deplete the Ozone Layer. At UNSW’s Centre for Sustainable Materials Research and Technology, Professor Veena Sahajwalla explained that the focus is on the bigger impact and creating technology and manufacturing methods that society really needs, not just another product that will end up in landfill. Further, many items headed for landfill need to be redirected as there are opportunities abound in recycling or reusing waste products. The panel, although all from different institutional backgrounds, agreed that interdisciplinary research is often stymied by issues of inadequate funding, or by institutional metrics that reward the individual over the interdisciplinary team. However, the panel was positive that momentum and demand continues to build for interdisciplinary research that can impact policy and provide real solutions to create more sustainable societies. To end the launch event, all speakers were invited to imagine what the 10-year anniversary edition of Nature Sustainability would look like. The answers varied, but all held a similar vision – for a diverse, inclusive journal that not only advised policymakers and industry on sustainable solutions, but also held them to account for implementing them.